Yesterday retracing the steps of Biggles and Co was a very full day and we compensated today with a much more lazy day and stayed home all day. I got up much earlier than Peanut had my bowl of fruit and fibre and updated the holiday blog. After this tea in bed was served to Lady P and another lazy hour was spent in bed because finally, I was on to a good holiday read. Dan Turgid Brown’s Inferno was well behind me now and I had finished my chick read novel, The Hourglass Door by Lisa Mangum (better than Inferno but still has overtones of a novel churned out from the all encompassing American School of Writing) so finally, I was into the World of Jack Reacher in The Enemy by Lee Child. I love Lee Child’s style of writing. These are quick turn books that you can read in a day, or if like me you are a slow reader, a week. They don’t challenge you intellectually but they move along at a swift pace. You can believe in Reacher and identify with his harsh justice. He is a tough guy and his fights are believable, you don’t find him escaping through some secret passage that reveals itself at the last minute to some two dimensional Professor of Symbols, who plods through unbelievable plots, ultimately achieving absolutely nothing. Brown’s writing style is appalling too – oh shut up about Brown lad – they all know he is pants too! Now back to Lee Child. He even reminds me of Hemingway. The sentences are short, precise, to the point, to me very reminiscent of Hemingway. Here the brevity of language really suits the subject matter. Short clipped, matter of fact sentences, seem to reinforce the military backdrop to the storyline and help the story move along from one dead body to another at pace. So this morning once my head got stuck into the pages of a Jack Reacher there it stayed. Breakfast had almost bumped into lunch, so we nipped to the Total Garage just up the road and got a baguette, which we fetched back and used to make a tasty lunch with bread, cheese, ham and pâté. Then for no better reason than because we could, we shifted the location for our reading session and moved to the pool. Here there were a few more distractions and my reading was broken up with a few swims. I started to notice that the totty count around the pool was particularly high. In fact our pool persistently attracts rather lovely girls to its pool side and I have not really got to the bottom of this yet. I guess it’s just one of those little conundrums that you like to ponder over while on holiday. Whatever, the reason it is always scoring a much higher average than the beaches do. I was lying there in front of a lovely enticing blue pool, shading the sun out of my eyes with my Reacher novel, quenching my thirst with some ice cold crystal clear water and admiring the girls poolside. Life couldn’t get much better – and then, Oh my God she’s got a sister! Meanwhile, Lady Peanut was definitely benefitting from the R&R and her mind had begun to wander and the seed of a thought that had been kicking around in her great mind, began to be watered and it took root and flowered in the sunshine. With her iPad in hand she began to put her blossoming thoughts down in words and her new mini blog A Cat Named Enzo was born. I have to say it’s very amusing, so seek it out and give it a read. So there you have a typical poolside scenario, of boy and girl. The Girl creates a blog about a cat named Enzo and I, the boy, ponder on exactly why we have such a high totty count by our pool. As good as the totty was though, I bet none of them could do a blog about Enzo the Cat as good as my own totty could! I lay there feeling smugger than ever! There is only so much Heaven that a man can take, so encouraged by my sudden desire for an ice cold beer,we tore ourselves away from the pool and popped into Charlie’s to cool down. From there and armed with our trusty old tartan shopping trolley we pushed on to Geant and did a mini shop to see us to the end of our holiday. 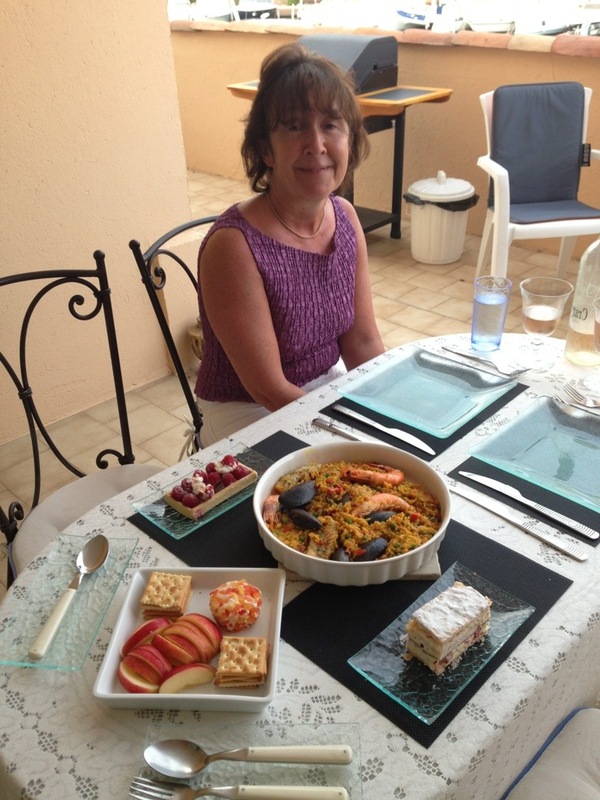 Back home and dinner was paella for our main followed by cakes and then cheese. 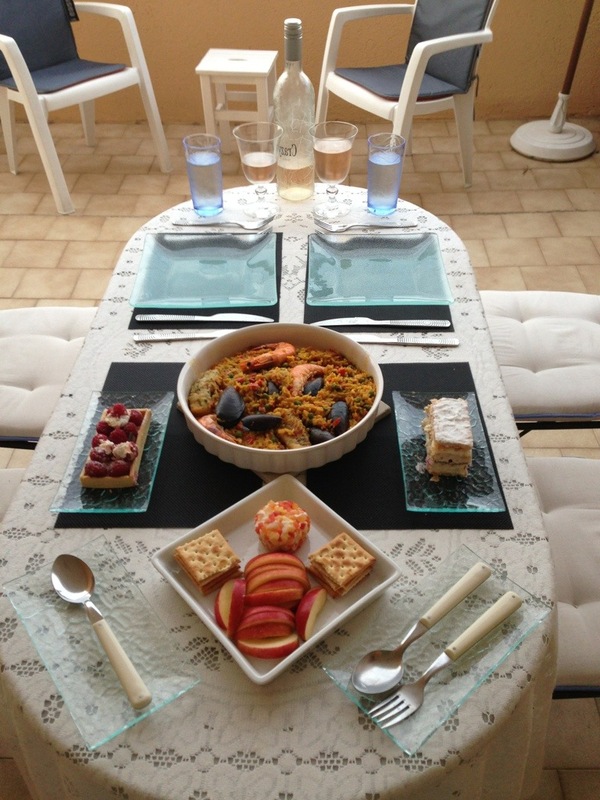 The paella really was delicious embellished as it was with mussels, king prawns and a large white fish steak and we made a mental note that next time they are cooking paella in those huge oversized pans at a local market we must pick some up. So there you have it another super lazy day.